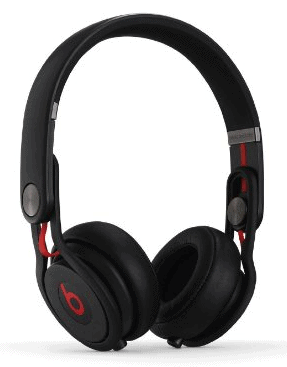 Beats headphones have become synonymous with audio quality and backed by Dr. Dre himself, the Beats product line has experienced enormous success in the last few years. Like all Beats products, deep bass notes are one the products major selling points and both the Mixr and Solo 2 products lines are no exception. Both of these headphones are of an on-ear design that provides many of the noise-cancelling benefits of over-the-ear headphones but with the added comfort and ventilation that the latter design simply cannot match. In the following Beats vs Mixr comparison, I’ll figure out where they stand out and who is the best fit for each. Bottom Line Up Front: This was a close one! But I slightly prefer the Solo 2 available here as it features a more balanced acoustic profile for everyday users. Like all Beats products, the Mixr headphones come lavishly boxed. Inside the box, you will find the headphones, a durable carrying case, an instruction manual, and two different cords. One cord is designed to work with Apple and Android products and includes the Control Talk+ feature – allowing you to answer, hang up, and mute calls from the cord. This cord also includes volume controls and buttons that allow you to skip tracks while on the go. The other cord is a partially coiled cord that looks like the cords used by DJs. This cord features a removable ¼ inch connector with a standard 3.5mm connector underneath. Although this cord does not contain the in-line controls of the other cable, it is a functional option that is only available with the Mixr product line. Interestingly enough, both cables can be connected to either the right or the left earphone for maximum comfort and if you really wanted to, this option also allows multiple sets of headphones to be daisy chained together so multiple headphones can listen to the same audio source simultaneously. Curved and sleek, the 40mm drivers of the on-ear design are discrete on your head while producing impressive sound across all audio ranges. True to the product branding, the Mixr produces deep bass with absolutely no distortion (even at unsafe listening levels). That said, these headphones also produce excellent midrange and highs for a complete listening experience that is difficult to not be thoroughly impressed with after listening for only a few minutes. 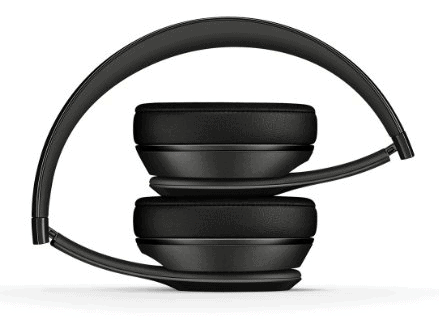 The Solo 2 is also an on-ear design that is extremely comfortable due in large part to the headphones’ lightweight. In addition to the standard Beats colors of red, black, and white like the Mixr, the Solo 2 is also offered in pink, blue, and gray. Unlike Mixr, Solo 2 only has one removable audio cable that can only be attached to the left ear cup. This cable does include the Control Talk+ feature mentioned in the previous section that allows users to skip tracks as well as answer and end phone calls. The multi-function buttons can also be used to play and pause tracks. Similar to Mixr, Solo 2 provides a full audio range without distortion but the bass is obviously driven a little harder than both the midrange and high tones. Although audio purists may find this to be a poor quality musical representation of many popular music genres, these headphones are marketed for people who want big bass sound from their headphones and depending on the type of music you listen to, you won’t be disappointed. Although heavy bass lines are the Solo 2’s specialty, these headphones performed very well across a wide variety of musical genres including jazz, classical, rock, and of course, hip hop and dance music. The following table is a quick summary of the key advantages of both, side-by-side to help you decide. The reality is that there aren’t a whole of differences between these two popular Beats headphone lines. Both headphones look very similar although they are available in different colors and the only noticeable difference when looking at the exterior of both pairs is that the Mixr has audio cable plugs on both the left and right ear cups whereas the Solo 2 only has a cable input on the left ear cup. It’s also worth pointing out that the Mixr has been on the market for much longer than the Solo 2 and Beats Audio has spent some time improving the Solo 2 after the lackluster release of the original Solo series. One of these changes is a new Beats sound profile that makes the Solo 2 produce a “truer” sound – that is to say that although the bass reflex is still impressive, it doesn’t sound overpowering like the Mixr sometimes can. The new sound profile of the Solo2 puts more emphasis on the mid-and high-range sounds for a more balanced listening experience. The Solo 2 is also slightly lighter than the Mixr; something to consider if you plan on wearing the headphones for hours at a time. Basically, the Mixr line, which was designed with the help of David Guetta, is the better option for DJs that want to replicate the sound heard on the dance floor. The heavy hitting bass is a close match to the sound profile of most PA systems used in clubs. Solo 2, on the other hand, is a better fit for the everyday audiophile who is looking for a more balanced sound profile while still enjoying the build quality and style that the Beats brand has become known for. Both headphones are an excellent choice for just about anyone but the slight difference between the two models should be enough to sway consumers one way or the other depending on exactly what features and sound profile they are seeking. Bottom Line: If I had to choose one today, I’d personally go with the Solo 2 (available here on sale here).